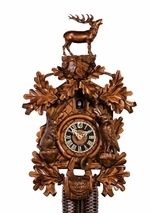 This large and beautifully-carved cuckoo clock speaks of old-world charm and craftsmanship. The carving shows a still life of the life of a hunter. It’s dimensional carvings include hunting trophies, live game (including beautifully carved squirrels holding acorns), a hunting horn, ammunition pouch, and guns, all surrounded by carved oak leaves. This clock is hand made in the Black Forest in Germany. The mechanical brass movements are driven by three weights and time escapes with the tick of a traditional pendulum. The bird and dancers move along with the mechanically produced music and cuckoo call.The sound of the bird is produced by real wooden whistles and the music box movement is hand made in Switzerland . Even the packaging has old-world charm, as only paper is used. The factory packing is made with recycled materials. This clock makes a great gift for the young and old alike. This clock would be perfect for those who love to hike or hunt.